Children can be forced to grow up at a lightning pace, for both wanted and unwanted exposures plague the false purity attributed to childhood. Vee Speers in her latest exhibition The Birthday Party at Stockholm's newly opened Fotografiska Museet presents more than a dozen oversized, illuminated portraits of costumed children, decorated in the light of pastels and creams, sharing the stage with well-chosen props, objects of shock and intrigue—even limp feral creatures. Not the cheerful embodiment of innocence, these children often allude to darker actions, discontented realities. Yet, they look as if en route to some fantastical version of a birthday party, even if it turns out to be nothing they’ve yet experienced or imagined. Vee Speers' choice of seemingly harmless color and sheen for this series emphasizes the chaste and dreamlike, yet many of these portrait scenarios push the viewer into more imaginative, even contradictory inscapes. Many of Speers' photographs possess ghostlike, neorealistic compositions, though deliberately staged to the point of being eerie and macabre. For instance, Speers displays a diptych of a little girl in a simple patterned dress with dark hair and a perfect reserved face, yet in the second portrait, the girl's face is far from ideal. Instead, she wears the grotesque mask of an aged, folklore-inspired crone. This same image is closely linked to death (crone literally meaning 'carrion'), the occult and that which lurks in marginalized territories of the excluded and unfortunate. In another image, a stark boy holds a rifle in his small hands, while two hand guns are positioned down the front of his camouflage pants and yet another dangles from one of his pockets. This is not appropriate for any young child, yet in Speers' mystical world, these children can mock and mimic the stages of adulthood with no consequences. This provocative series makes one think: what proves inappropriate for the youth might also be for the adult—for no human being, regardless of age, perhaps deserves easy access to violent tools or their repercussions. And as yet another of Speers' images hints with its asexual figure behind a gas mask holding a crushed, dead rat in a trap, humanity is a fragile, strange arrangement balancing between brutality and purity. Other invited characters in this questionable celebration do not shy away from role-playing or gender bending explorations. One slender boy, shirtless and dressed only in silk boxers, stands in a sideways, coy fashion with one heavy boxer glove protecting one hand while the other is wrapped in white tape. His glance is provocative and somewhat fearless, and he, perhaps, attempts to represent the rebel and fighter, as well as the victim. Another pale child wears a white, fluffy ballerina tutu; this child first appears girlish in face and frame with longer brown hair, but at second glance, the boy's ambiguity becomes more apparent. Lastly, a dark-eyed girl wears the black wings of a tiny nominal angel or demon, almost appearing to look deep into the soul of someone brave enough to glance towards this powerfully framed Medusa. At this askew party, each image is much better than any other gift received. 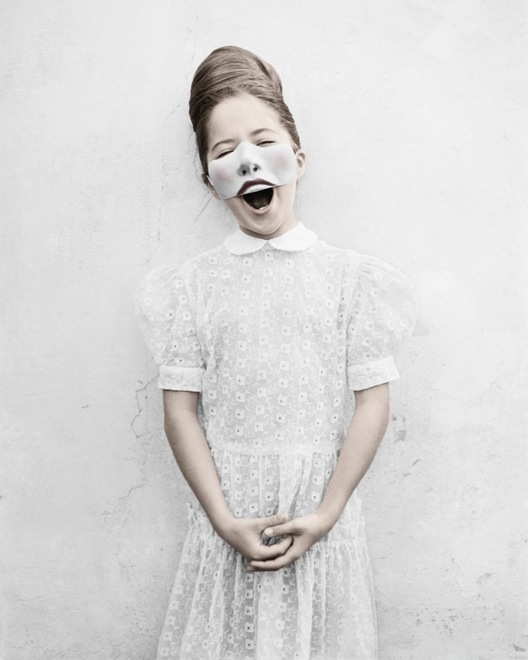 Vee Speers, Untitled #1, Untitled #3, Untitled #14, Untitled #15, Untitled #16, Untitled #30. Courtesy of the artist and Fotografiska Museet.